Any one following me on insagram my have seen that I was trying to get a tattoo sleeve t-shirt for T, there are some lovely ones about and reasonably priced but the delivery from the USA was extortionate, just over £30.00. I don't mind paying that for quality but not for delivery charges which are more than the actual product. Moan over! I decided to make own! 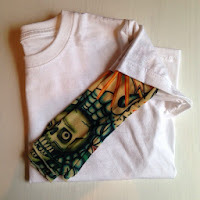 After a little time on eBay I ended up buying a fruit of the loom t-shirt for £2.00 and some tattoo sleeves from china £3.50 both with free delivery. I guess at this stage I should point out that I in no way condone tattoo's for minors and like most of you I'm sickened by the images on Facebook and in the papers of these idiots tattooing toddlers and small children. 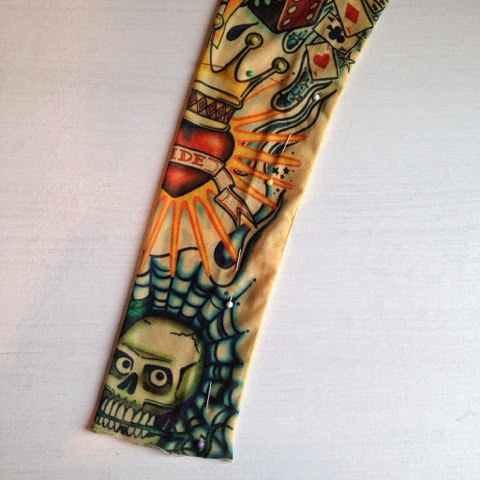 Tattoo's are a part of life these days and love them or hate them you have to accept that. 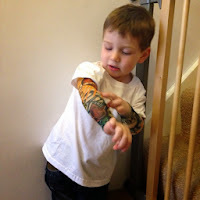 I happen to love them and if I was 10 years younger I would have had a sleeve myself. For some children growing up with parents with tattoos is perfectly normal. I think these sleeves are really cute because they don't look real, that's the point, they are in no way supposed to look like you've had your toddler tattooed. 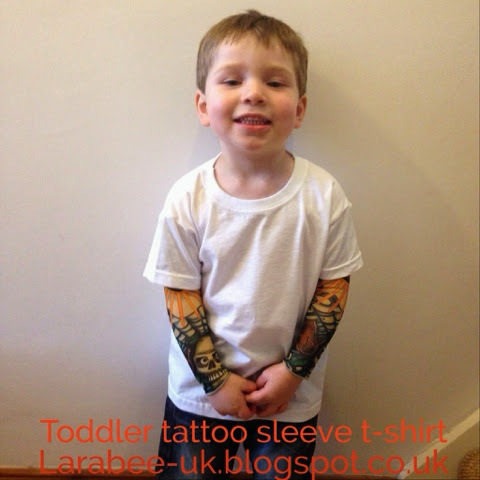 For a child like T who's Daddy has a half sleeve and large leg piece having a tattoo t-shirt is being 'like daddy'. Anyway onto the process, T tried on the sleeves and I pinned up the size I needed, I was really worried about cutting them as they are a bit like tights, I took the plunge and cut the top off, no laddering, no running - phew! Rather than cut the side down now I ran it through the sewing machine, using a loose tension to accommodate for the stretchiness. Once sown, I cut off the excess, again no laddering! I then oversewed the seam to make it nice and secure. I didn't bother sewing the top as it didn't need it. 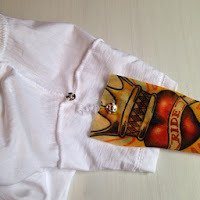 These sleeves cannot be washed and a white t-shirt and T will not last long without being able to wash, so I chose to attach the sleeves with press-studs. I sewed the flat one onto the sleeve rather than the t-shirt, in hindsight this was a big mistake and I should have done it the other way round, when I put the sleeveless t-shirt on T the press stud rubbed, I don't think the flat one would have. When the sleeves were attached it was fine. If T wears the T-shirt without the sleeves I'll just pop a flat press-stud on it to make it more comfortable! So there you have it, a really cheap and easy DIY!